The American Heart Association's ACLS Course has been updated to reflect new science in the 2015 American Heart Association Guidelines Update for CPR and Emergency Cardiovascular Care. This course builds on the foundation of lifesaving BLS skills, emphasizing the importance of continuous, high-quality CPR. Students certifying for the first time- The Initial course is approximately 13 hours (Over 2 days. 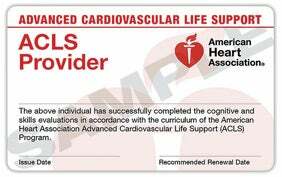 Students must complete the American Heart Association ACLS Pre Course Evaluation before taking the program. Access to this test is included with your textbook. If you have difficulty locating the code, please contact the CTC for assistance.